Last week was a big week for student retention and persistence aficionados. The Educational Policy Institute held its 2010 Retention 101 workshop in Dallas, Texas, complete with participants from across Canada and the United States. Coincidentally, the US Department of Education released two important data reports documenting graduation and persistence rates at institutions of higher education in the United States. The outcomes, in sum, suggest that graduation and persistence rates are relatively static over the last decade. But what else could we really have expected? Have institutional practices changed? Has the way we reward colleges and universities changed? Have we provided more resources targeted at students and student success? Have we improved the preparation and placement of students? In fact, with consideration of state budget cuts over the past several years, and the reality that more cuts are over yonder, it is reasonable to suggest that we are lucky to be doing as well as we are and that we are likely to do worse over the upcoming short and medium term. What is it they say about the definition of insanity? Doing the same thing over and over again and expecting different results? Well, that about sums up the entire knowledgebase of student retention. Much to the anticipation of some of us in the retention world, and especially us at EPI, we welcomed new data from the Beginning Postsecondary Student (BPS) Study from the Department’s National Center for Education Statistics (NCES). This latest survey began with approximately 16,000 students who began postsecondary studies in 2003-04, with follow-up surveys 3- and 6-years later. The release of these data is important since this is the first longitudinal study on postsecondary students since the BPS: 96/01, which is now a little long in the tooth. About two years ago, I ran analysis of the BPS: 04/06 three-year follow-up with the same dataset from BPS: 96 data, finding that the interim results were almost identical than those eight years previously. I expected—perhaps hoped—that persistence, graduation, and time-to-degree rates were moving ahead. Alas, it was not to be. Insanity persists. Thus, I expected to find results in this latest data release similar to those of the BPS: 96/01. And I was right. 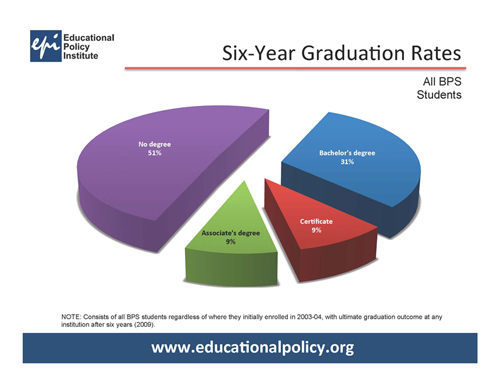 As illustrated above, over half of all students who began a postsecondary education in 2003-04 did not attain a degree six years later. This is about the same as the 1995-96 cohort. Things have not changed greatly. The data above are somewhat random. I chose variables which I have followed for years to see the impact on student success. What we know is this: postsecondary success is heavily influenced by income, dependency, risk factors, work, curricular habits in high school, high school achievement, and attendance status, among other things. Of great concern is that students who do not complete their college programs have a much higher propensity to default on their student loans than students who complete, and that adult students face formidable barriers to postsecondary success compared to traditional-aged college students (17-18-year olds). This is a quick first glance at the data, and I urge you to look at the NCES First Look report written by the gang at MPR. ALSO, if you want to see some preliminary charts that I created, CLICK HERE. ANNOUNCEMENT: EPI is pleased to announce the 2011 Retention 101 CANADA Workshop to be held March 20-22, 2011 in beautiful Banff, Alberta. Click Here to learn more and register for the event.